Welcome to the Web Page of United Bancorp, Inc. The fact that you have stopped here means that you are a very special person. We welcome you as an investor in our Company as well as a user of our Bank's products. of our bank team members, through career growth opportunities and a comfortable environment with modern equipment and facilities. Our Company began in 1983, when the shareholders of The Citizens Savings Bank in Martins Ferry, Ohio turned in their stock in exchange for that of United Bancorp, Inc. We began as a one-bank holding company and in December of 1986, we became a two-bank holding company with the acquisition of The Citizens-State Bank of Strasburg. And we grew to a three-bank holding company on July 7, 1998 when The Community Bank of Glouster joined United Bancorp. To learn more about our Company, you may review our Annual Report online. Please read my Chairman's Letter and learn the highlights of our most recent year. Also, take a few moments to review our corporate profile, which outlines a rich dividend history. Our Decade of Progress will provide to you each year's financial performance. United Bancorp, Inc. and its subsidiary banks have a rich history of growth through capital expenditure. In 1984, we moved into our new headquarters office located in Martins Ferry. Following the acquisition of The Citizens-State Bank in 1986, we built a new full service banking office in Dover in 1990, acquired our New Philadelphia and Sherrodsville offices in 1992 and purchased the Dellroy office in 1995. In 1994, we moved into our new Operations and Accounting Center in Martins Ferry, which allowed us to consolidate the operations of our affiliate banks. We introduced Check Image Processing to the Ohio Valley in 1996. During 1997, we opened our first In-Store banking facility in Riesbeck's Food Markets in St. Clairsville, Ohio. In July 1998, we expanded into Northern Athens County with the acquisition of The Community Bank with banking offices in Glouster (2), Amesville and Nelsonville, Ohio. On January 27, 1999, The Citizens Savings Bank expanded to five locations with the purchase of our Jewett, Ohio office. The Community Bank received approval to relocate its headquarters to Lancaster, Ohio and opened its new main banking facility in the Lancaster business district and a full service banking center with drive thru on East Main Street in January 2000. On April 21, 1999 The Citizens State Bank of Strasburg was merged into The Citizens Savings Bank, Martins Ferry expanding our customer service availability to ten locations in Belmont, Carroll, Tuscarawas and Harrison counties. On July 1, 2007 the offices of The Community Bank were merged with and into the charter of The Citizens Savings Bank but continues to operate under their trade name of The Community Bank as a division of The Citizens Savings bank. On September 19, 2008, The Citizens Savings Bank acquired three offices in Eastern Ohio of a failed bank. 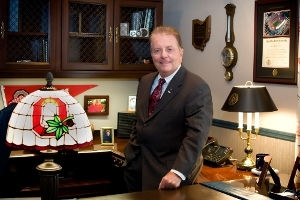 During 2010, the company completely upgraded its Information Systems and Technology and opened its new Tiltonsville Banking Center in first quarter of 2011. Through its single bank charter now with its twenty banking offices and an operations center, The Citizens Savings Bank through its Community Bank Division serves the Ohio Counties of Athens, Fairfield and Hocking and through its Citizens Bank Division serves Belmont, Carroll, Harrison, Jefferson and Tuscarawas. United Bancorp, Inc. is a part of the Russell Microcap Index and trades on The NASDAQ Capital Market tier of the NASDAQ Stock Market under the symbol UBCP , Cusip #909911109. To our shareholders, we say "Thank You" for investing your funds and your trust in our Company and its banks. To our customers, we say "Thank You" for using our services and we welcome your input in improving how we can better serve you. To our web browser's, we say "Thanks for stopping by." Come join us as we reach out to new heights. Our pledge is to continue earning your respect and your confidence. Our Directors, Management Team, and Staff are committed to making this happen.